Twist on a Classic: Tilapia Milanese – Pao Says, "Open Wide!" My husband, Ryan, was craving chocolate chip cookies for tonight… So I figured I would make something healthy for dinner. I’ve made chicken Milanese in the past, but tonight, I thought I’d try something new and make it with tilapia instead! Run the tilapia filets through the stations , making sure to shake off the excess before moving on to the next station. Once the filets are breaded, set them aside on a plate to rest a bit before you begin to fry them. While they sit aside, assemble your salad. Mix the arugula with the chopped veggies. To make the dressing, squeeze your lemon juice into a small bowl. Whisk the juice while you add in the olive oil. Add a pinch of salt and you have a nice fresh lemon vinaigrette! Hold off on pouring it over your salad for now… Cook the tilapia first so that the salad doesn’t get soggy while you wait. To cook the tilapia, pour some vegetable oil into a pan- just enough to coat the bottom. Heat it up on med-hi. Once it’s hot, fry your tilapia. Depending on the filet size, it should take about 2 minutes or so per side. Once it’s ready, take it out of the pan and pat it on a paper towel to rid it of excess oil. 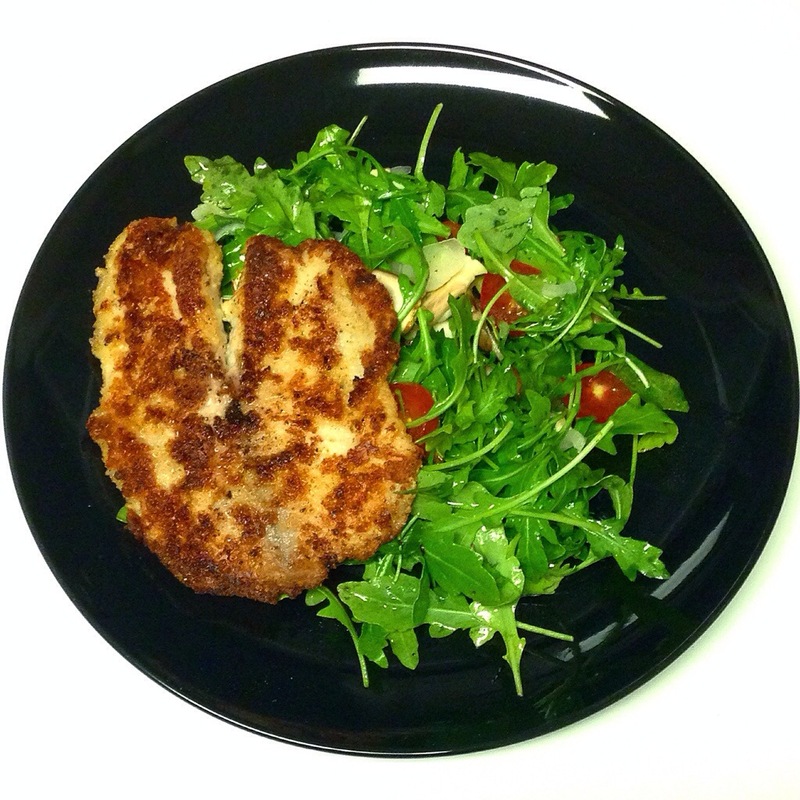 To plate, dress and toss your salad, serve it on a plate, and top it with your tilapia… Bon a petit!